NLM’s newest Profiles in Science site features Congressman John Edward Fogarty (1913–1967), who was called “Mr. 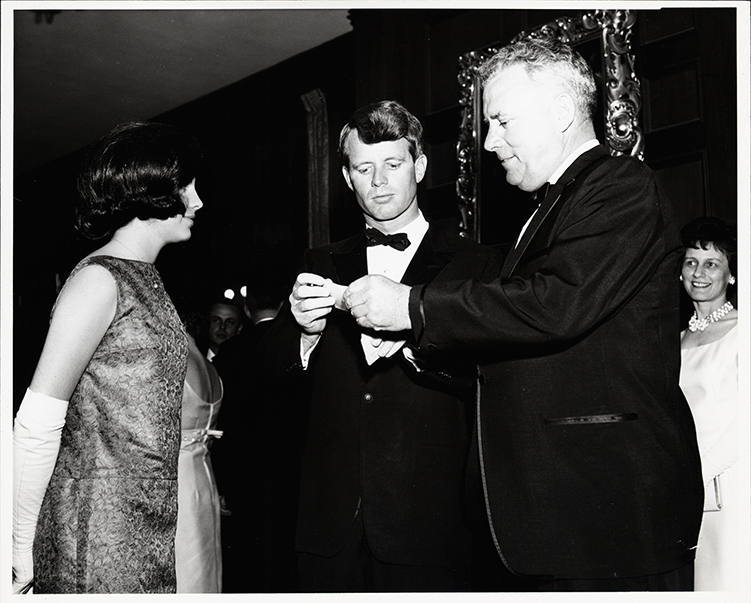 Public Health” for his dedication to increased federal funding of medical research and health care. 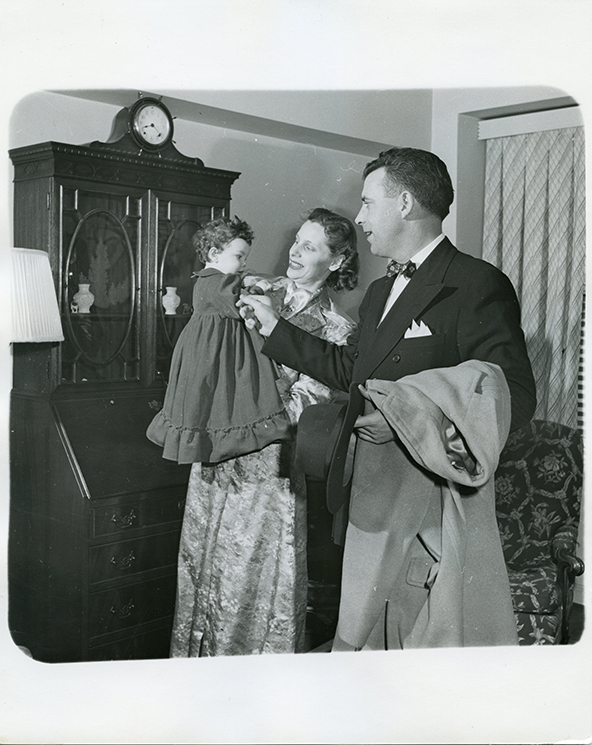 The site was a collaborative project with Phillips Memorial Library, Special and Archival Collections at Providence College, which holds the John E. Fogarty Papers, and Mary Fogarty McAndrew, who generously contributed her family photos and stories, along with an interview with Fogarty’s colleague Melvin R. Laird. Recently, NLM historian Susan Speaker asked Ms. McAndrew to provide some personal perspectives on her father. Susan Speaker: John Fogarty was a force to be reckoned with in Congress, especially when advocating for a cause—whether it was more funding for NIH or progressive legislation like the Older Americans Act; he commanded a lot of power as chair of the Labor-HEW appropriations subcommittee. And yet no one ever described him as loud, overbearing, bullying, or otherwise obnoxious. Indeed, he was often praised for his humility and easygoing manner. What influences in his early life—family, social environment, and so on—do you think shaped his character? Mary Fogarty McAndrew: This is a good description of my Dad but make no mistake about the fact that although he was easy going and humble, he was a formidable foe when it came to the important things that he believed in and fought for: health care, education, libraries, support for the arts and humanities, legislation to improve the care of people with disabilities and senior citizens just to name a few. My Dad was the third child in a second-generation family of Irish ancestry living on a farm in rural northwestern Rhode Island. He was 17 when his mother died and I am sure that was when he learned the value and indeed the necessity of cooperation. With three younger brothers and the rigors of farm life, everyone had to pull their weight to keep the family together and food on the table. His older sister took over many of her mother’s responsibilities and even managed to earn a degree in nursing. My Dad remained close to his sister Margaret until her death. The family’s faith and fortitude was tested time and time again with the deaths of three of my aunts, all at a young age and all leaving small children. Having only one child—my parents lost their first child shortly after birth—we cared for several cousins when their mothers passed away, and lived for a time at the family farm with my aunt and uncles. SS: Your father’s job was quite demanding, probably all-absorbing. What was family time like at the Fogarty home? Did you all eat, drink, and breathe politics? MFM: Being a Member of Congress is a demanding job and at times can be all-absorbing but my parents maintained a very active life with my Dad’s family, the cousins that lived with us, my Mother’s family and a close circle of longtime friends. Our phone rang a lot and people actually came to the house seeking help. My Dad took his position very seriously, and he and his staff were extremely conscientious when it came to helping constituents. People still tell me stories about the help that my Dad was able to give them. 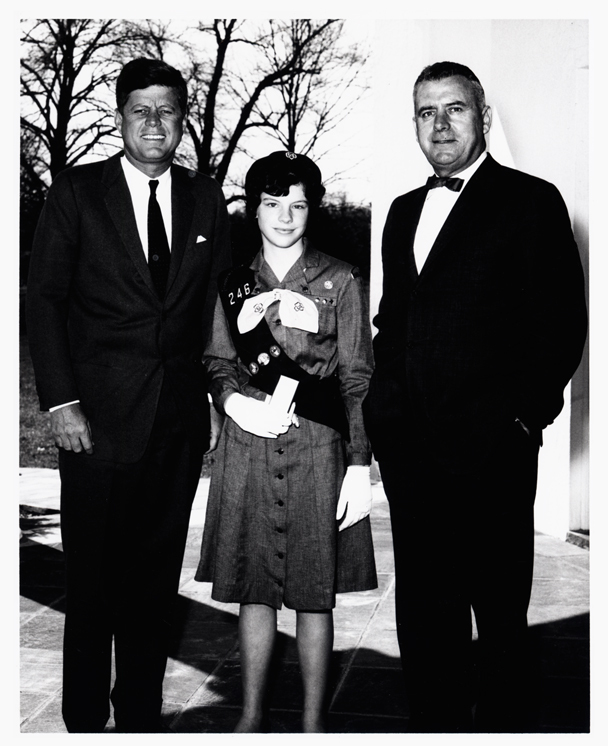 SS: As a congressman’s child, you met a lot of notable politicians, including the Kennedys—did this exposure to political life and your father’s career inspire you, or was it just “dad’s job” and unremarkable from a kid’s perspective? MFM: I was born in Washington, DC seven years after my Dad took office, so in many ways this life was just my Dad’s job, but it was far from unremarkable and definitely inspiring. These were the days of the New Frontier and the Great Society, when anything seemed possible, even going to the moon. I saw firsthand what collaboration and cooperation could achieve. My Dad did a masterful job of working “across the aisle” to secure support for the important programs that were, and are, so important to the health and welfare of our nation. SS: Your father accomplished so much during his career—what programs and/or legislation do you think he was proudest of? SS: Children with intellectual and developmental disabilities had a special place in your father’s heart, as evidenced by the legislation he sponsored and by his personal contributions to the Rhode Island Parents Council and the establishment of the Fogarty Foundation. Why were these particular children so special to him? MFM: This cause was very important to my Dad because the need was so great. My Dad was really motivated by need and whenever he could he did something about it. He was especially loyal to family, friends and the people he served. When his friend J. Arthur Trudeau’s son Kenny was born with disabilities, he learned very quickly how difficult this was for families. He made this a top priority by getting the first-ever federal funding in the field and incorporating a foundation in his home state to support people with intellectual and developmental disabilities, the John E. Fogarty Foundation, that I, along with family and trusted friends, continue today. SS: Had John Fogarty lived several more decades, do you think he would have continued to run for Congress? If he had retired, what would he have done with that time? 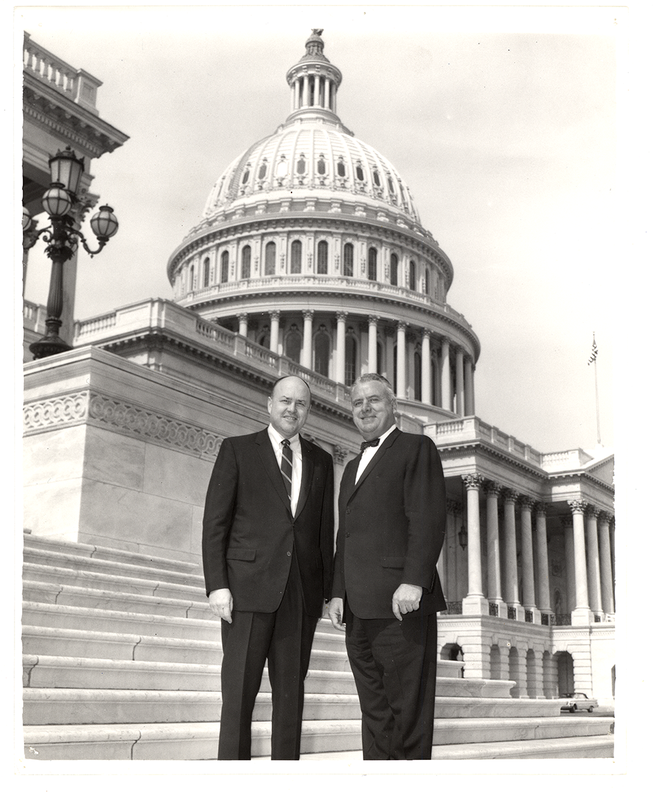 MFM: When House Speaker Sam Rayburn died in office [in 1961] John McCormack, a Democrat from Massachusetts, needed my Dad’s help to rally support from southern Democrats in his bid to become Speaker. In return he would support my Dad for that position when he stepped down. Unfortunately, my Dad died at his desk in 1967 and John McCormack remained the speaker of the House until 1971. Had my Dad become Speaker he would have seen that position as another opportunity to expand his mission of improving the health and welfare of all and I believe would have stayed on as long as he could have made a difference. I can’t imagine that my Dad would have retired, but if he did he would have found a way to continue his crusade in the private sector. SS: What lessons did you learn from your father? MFM: My Dad was a very humble man—a man who gave more than he received. He never forgot where he came from. He was a man of great integrity, decency, compassion and conviction. His word was his bond. I think that’s what made him so successful in the House. I think the most important lesson here is that nothing will get done unless we can collaborate and work together to make this country great. SS: Congress has changed a lot since your father’s day—what could today’s legislators learn from the example of John Fogarty, Melvin Laird, and their colleagues? MFM: My Dad and Mel Laird really worked “across the aisle” in the best sense of that phrase. They truly focused on issues that concerned all voters, not just Democrats or Republicans. My Dad was very proud to report to a local news station visiting his committee room in the Capitol that for 11 years his committee had produced a unanimous report because “there are no politics in this committee because these departments (labor, health, education and welfare) affect every human being in our country.” My Dad always recognized his colleagues from “across the aisle” and was quick to credit them for their contributions to the committee’s success. SS: Is there anything else you would like people to know about your father?